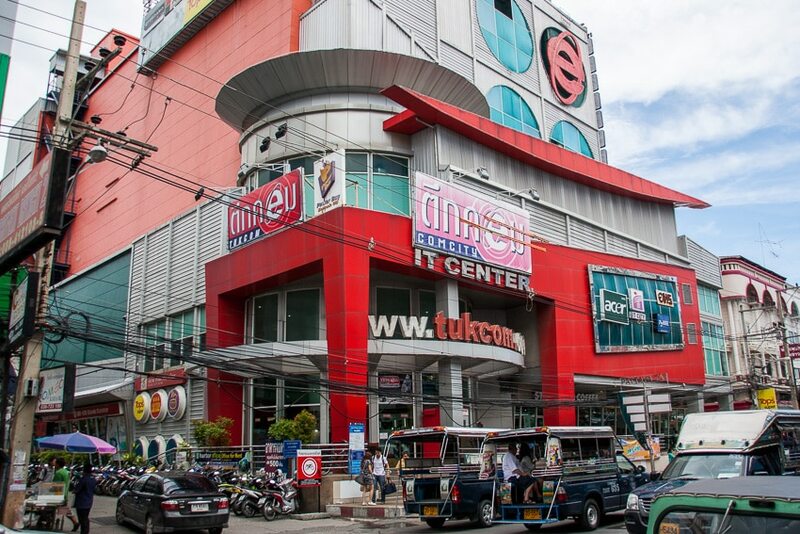 If you have to buy any type of computer gear, smartphone, Thai SIM card, or just about any other type of personal electronics or IT product you can think of – head on over to Tukcom Pattaya. The store is located on Pattaya Tai (South Pattaya Road) & Soi Buakhao. It is the big red building with an (what I am sure is some type of copyright infringement) image of the Internet Explorer logo plastered to the outside of it. You can’t miss the place. The most popular floor has to be the cell phone area. It is the best place to buy a new smartphone is Pattaya. There are dozens of small little shops selling everything from smartphone cases to the latest iPhone, Samsung tablets, and Apple iPads. The place is always crowded with people doing a good trade. If you need to get a Thai SIM card this is the floor for you. There is a DTAC stand in the back that will sell you one and get you set up. You’ll need your Passport. The upper floors are a mixture of various small computer shop, again mostly selling variations of the same thing. You can find all kinds or software and computer accessories available. If you need to have your computer repaired there are several shops that will work on your laptop or desktop for you. The underground level doesn’t get much traffic, except for the people who know about it. You’d never guess there was another floor below the ground floor as it isn’t very well marked and the staircases don’t seem like they are going to another shopping level – but they are. Here you can find some good prices on groceries and other food stuffs, as well as a pretty decent food court. They have a selection of clothes for sale down there as well. With so many little shops right next to each other competing for your business, it is quite easy to haggle on prices. It helps to have a good idea of what the good costs back home and what you are willing to pay for it before you go shopping. I’ve found that when someone quotes me a price, I simply smile, acknowledge the price is too high, and let them know I’m going to check other stands. Usually, they will stop you with something along the lines of “what you want to pay?” Give them your bottom line price. They may agree to it right off or start a negotiation. Very few times has the original asking price been what I’ve paid in the end. The Harbor Mall recently opened up in North Pattaya. It is going to have a Tukcom annex shop inside, helping to better serve the IT needs of the North Pattaya, Naklua, and Wong Amat crowds. Other Tukcom Stores: Sriracha, Chonburi, Udon Thani, Khonkaen. The parking situation at Tukcom Pattaya is pretty bad. There is a small parking lot that is filled up quickly in the morning by the various vendors and employees. The side streets around it are lined with motorbikes (sometimes double parked) and very little parking can be found. If you can walk, take a baht bus or other means of public transit you will be much better off. If you drive your car or motorbike you will be fortunate to find a parking spot nearby. Wear a comfortable set of trainers. Have any questions about Tukcom Pattaya? Ask a question in the comments below. yes …go there and get sheated .. they sheat everzy falang ..the house of gangsters ! be carefull . some offer you onlz 1 week or 1 month garanty ..thats against thailaw…do not belief ist , call a policeman !!! Thanks for commenting Georg, sounds like you’ve had a bad experience at Tukcom. As far as I know, it is the only game in town for cheap electronics and computer accessories. If you have other options on where to shop in Pattaya I’d love to hear them. You have been unlucky Georg. I have used their computer repair section for the past 7 years and also bought phones there as well. Never had any trouble and never overcharged. Not sure what kind of Farang you are but you certainly ain’t English ! Whoops. Thank you, good catch. I’ve updated the article. Can I sell or trade in my cellphone at tukcom?